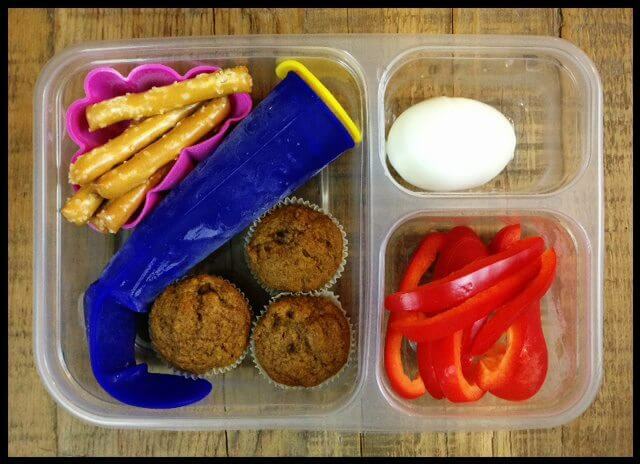 Our favorite school lunch supplies including the divided Ziploc container and what lunchbag we fit all of this into. Everything you could ever want to know about the pictured, brightly-colored smoothie/freezie pop molds. Our full recipe index where you can find most (but not necessarily all) recipes pictured below. Before we dive into the pictures though I want to make sure you know about our meal planning sponsor…The Fresh 20! Through their service you’ll receive 5 unprocessed dinner recipes each week that can be made from only 20 fresh ingredients (organized shopping list included). The cost is $5/month and you can choose from their Classic, Vegetarian, or Gluten-Free plan. If you are struggling to get a wholesome dinner on the table every night why not let someone else do all the planning for you? Homemade tomato bisque (with whole-wheat noodles floating in it), melon/raspberries, a zucchini muffin, and water. 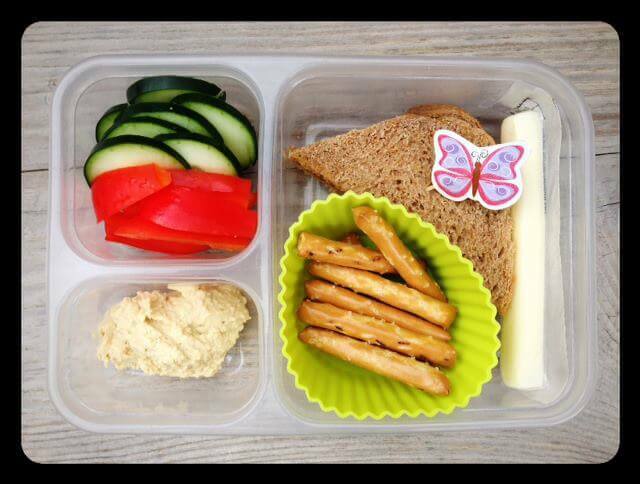 Please share your school lunch ideas in the comments below! I have a 9 and almost 13 year old boy. They both have symptoms of hypoglycemia/adhd/sensory, etc not sure what else. 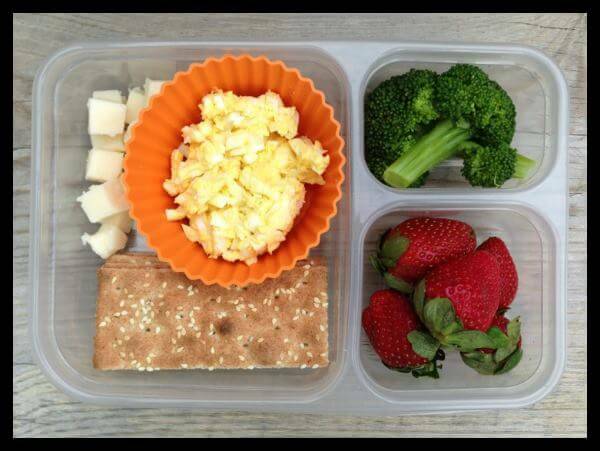 I am trying to make healthy lunches for school. I do ok on certain foods but they are picky at times. I canâ€™t seem to find other alternatives besides sandwiches every day. I can’t find a thermos for soups or milk to stay hot or cold. They don’t eat till after 12pm. I have to keep snacks in the nurse’s office for them to have in case they start feeling sick. I don’t have a lot of time to make a bunch of food. How do you keep the frozen smoothie pop from melting? Thanks for the help. I use the thermos that they show for my son. He also eats after 12 and I make sure I make the food pipping hot and put it right in the container and seal it immediately. He always says that when he opens it later in the day it is still hot. 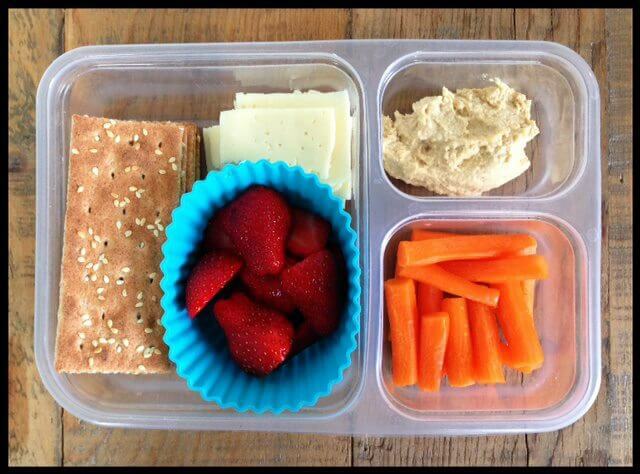 I know it can be tricky to get kids to eat especially if they have their ‘love’ food (you mentioned sandwiches). My advice is to let them have sandwiches for most lunches, but make them healthier by skipping processed cold cuts, etc. I like to make some extra chicken or whatever meat I’m cooking and just thinly slice that for sandwich meats- the cheese is your choice- then you can add some other veggies in there and make sure the bread is whole grain. If you’re going with a PB&J you can switch up the type of nut/seed butters for variety and go for the least processed kinds (you can even make em at home in the processor!). 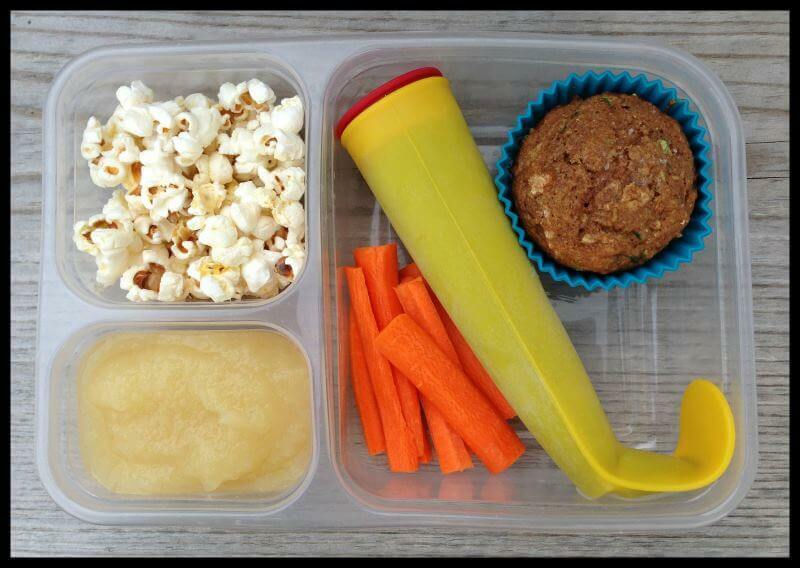 This helps to avoid extra sugars and help w your kids’hypoglycemia concerns. Also, adding some cinnamon to their sandwiches, yogurts, etc is great because that keeps sugar from being absorbed into the bloodstream, so if theyre having a healthy sugar but it’s a bit much you can curve these unwanted effects (insulin spikes and such). I say let them have ‘healthy sandwiches’ because you can also incorporate good side ‘dishes’ that they enjoy to help keep the meal well-rounded. Have them help you make snacks for the next day and they’ll be much more excited to take part in eating something they helped plan/create. 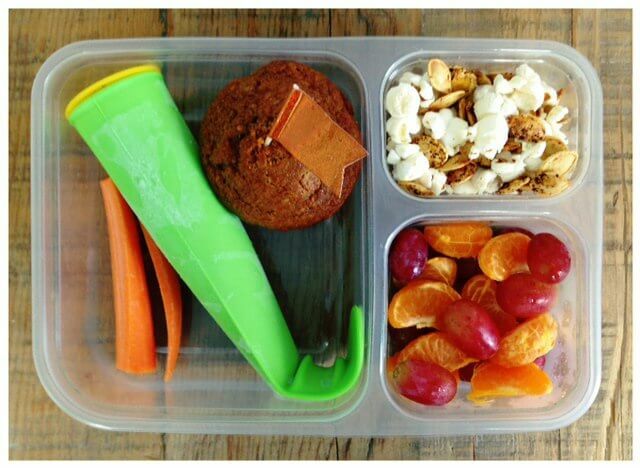 Hi – Who made the plastic “bento”-like container? Ziploc? Thanks! My 4 1/2 yr old daughter is in daycare all day, from 9am – 6pm. I send her to “school” with lunch and snacks for two afternoon snack times. 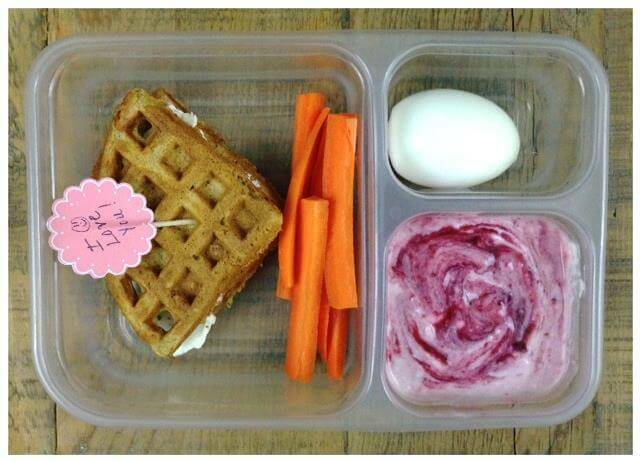 Til now, her snacks have been Snack 1: yogurt with wheat germ and fruit, and then Snack 2: a snack bar or homemade muffin. I see in your girls’ lunches you often serve them a muffin and/or yogurt. 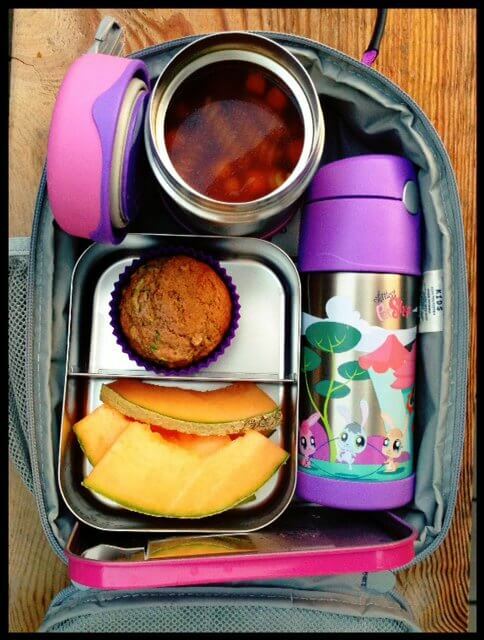 I would like to copy some of your lunches for my daughter but don’t necessarily want to give her two servings of yogurt or two muffins in a day. How would you recommend I divvy things up? I ordered the regular sized silicone muffin cups, but am disappointed that they don’t reach the top of the ziploc container when I have the lid on. I am afraid everything will just spill out. Do you know if the jumbo size reach the lid so that it would keep the items from spilling out of the muffin cup during the day? These are amazing ideas, thank you so much for taking the time to share! I just have one question – I have two boys who are very big for their ages and eat A LOT. As it is now, I don’t feed them unhealthy food and they eat lots of fruits and veggies. 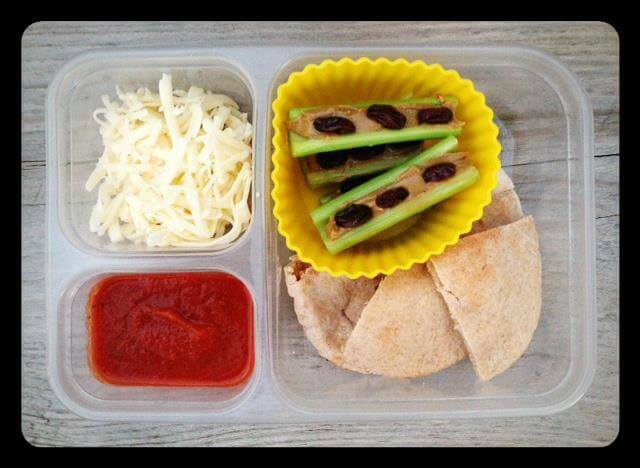 I look at these lunches and although fabulous, they would be more of a snack for my kids. Do you have any suggestions for meals a little heartier? To keep their bellies full longer? Thank you so much in advance! 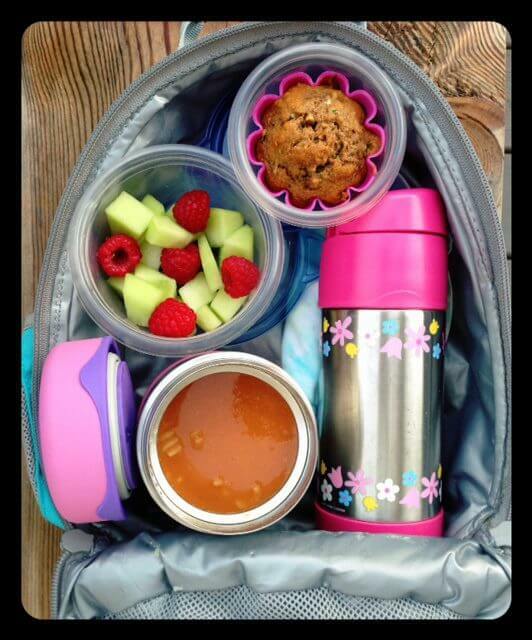 What ideas do you have for lunches that aren’t refrigerated at school?? 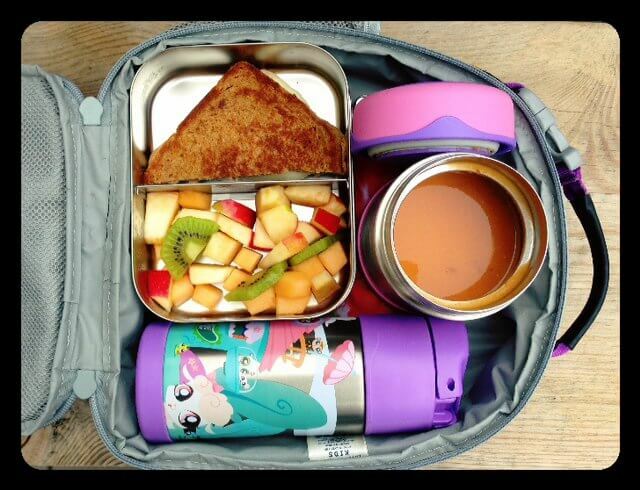 Her lunch box is insulated but I still worry about dairy and some meat products. What do you recommend? Hi! I love this blog! Y’all have inspired me and my husband to eat a real food diet, which we do at least 80% of the time. I have a question about deli meat: I read your post a while back about why you don’t eat deli meat, and then recently I’ve seen you posting Applegate ham in school lunches. Have you changed your mind or is this one special? I’m curious because it’s such a convenient meat. And I don’t think our grocery stores around here carry that brand. Any other brands you suggest? What about Boars Head? Thanks! is it possible to get the recipe for the veggie corn chowder? I did not see it on the recipe index. Do you know if boars head deli meat from the deli is a good choice of sandwich meat to buy? 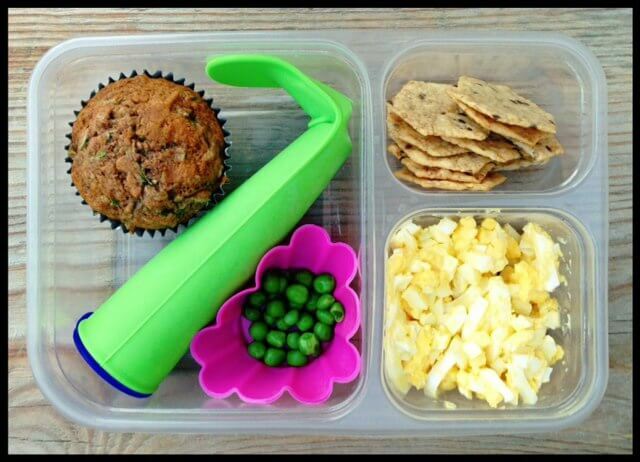 Hi, I love those silicone pop containers. Where can I get them? 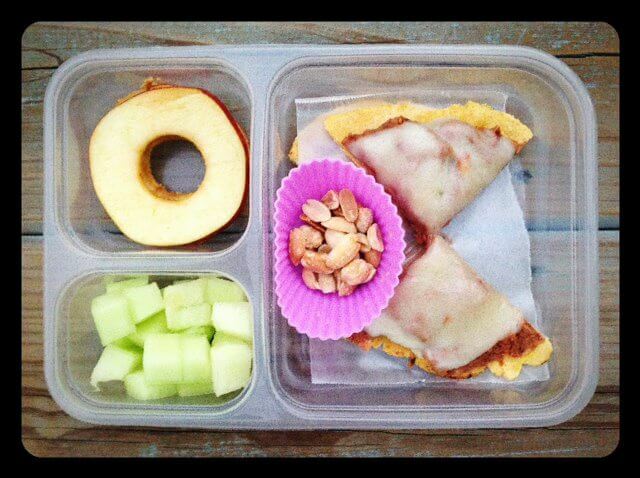 I love your idea’s for lunches. 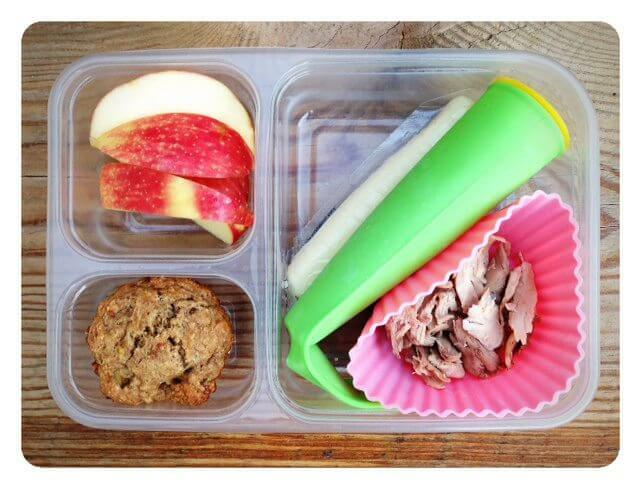 I homeschool and these lunches look like something my daughter will eat. Thanks, oh and do you have recipes for the smoothie’s? 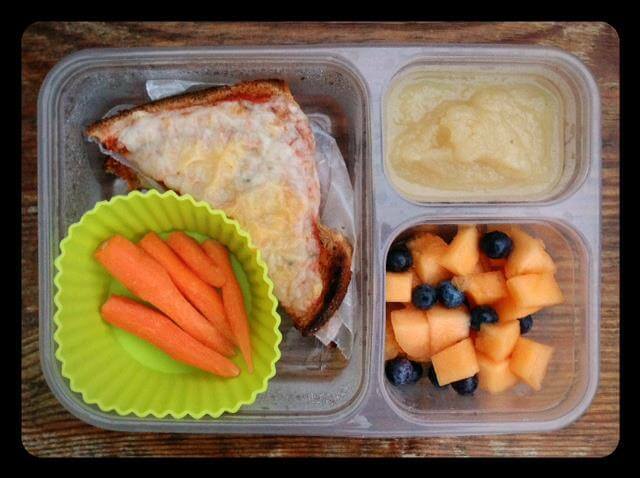 I love these lunch ideas, great pictures! Where can I buy the Santa/ bee / butterfly toppers, they look so cute.Thanks. 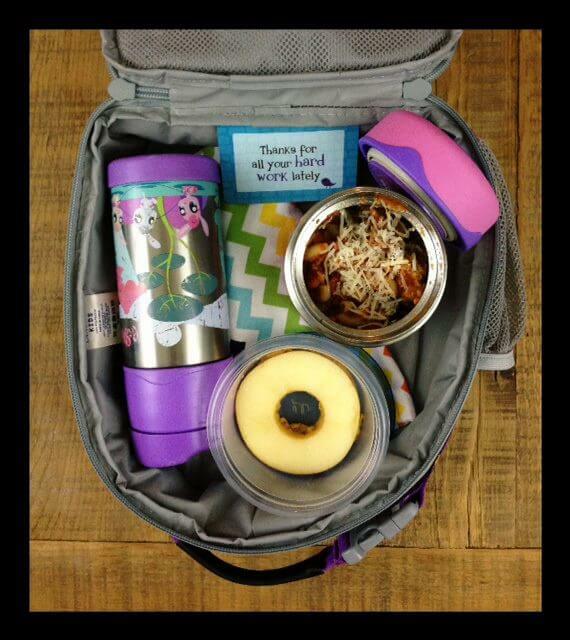 How do you pack a lunch for a 16 year old athlete? Is there a lunch box big enough? He is needing to eat lunch, a snack before practice and something after football practice. I think he is sick of sandwiches. These are awesome ideas, I will copy what I can. We live abroad at the moment (Kosovo) and we can’t get many things that you use – spelt is unknown, many fruits not available, I can’t get carrots reliably. Next year, I’ll start a vegetable garden so we can have a better supply situation. We can’t buy anything organic here but we try our best to eat as little processed food as possible. Not easy! Thanks for the great suggestions and I’m looking forward to your book!! Curious about the link for Ziploc. I will have to order these since we live in a tiny rural community, but I kinda loathe Walmart. However, if y’all get an affiliate deal I will use the link. If not I will source elsewhere. 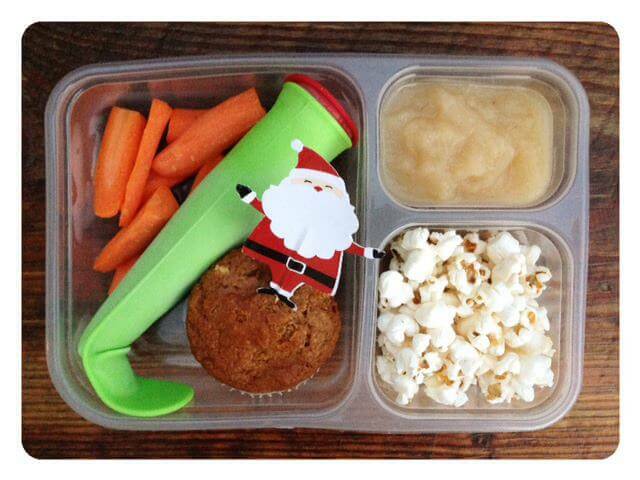 They’re such an awesome idea, and I also loathe plastic, but it sounds like these will work great to finally pack lunches me and the kids can be happy about. I buy cruchmaster multigrain crackers from costco. Hello! Do you have any suggestions for thermoses for warm drinks? I’ve searched everywhere however all the new thermos have the straws built in and I’m not so sure they would work for warm drinks for cold days at school. Trying for less messy too. I would attempt the hot/cold food containers but I think she’d spill it. Any suggestions appreciated! BTW, I LOVE your site! I forgot to add my daughter is 6 and don’t want a babyish bottle for her! THanks! Thanks! Ironically since posting my question and after all the searching I did on the internet I went to the Grocery Outlet and found a kids sized Contigo stainless steel thermos that works perfect. Its crazy that I posted the question after searching for over a month and then I find one! Thank you though in case I buy another I will get one of the Thermos ones!! 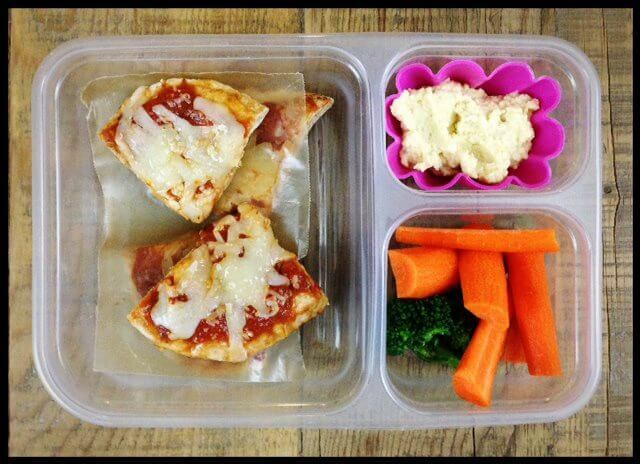 These lunches are fresh, healthy, and look delicious! Our daycare Academy has been incorporating real, organic food into our routine and I am glad to have found your blog! Thanks for sharing this great info! I am a stay at home of two children 4 1/2, 1 1/2 years of age and am currently 31 weeks pregnant I am overly tired these days and was wondering if you lunchbox recipe or any of you recipes can be pre made and stored for quick lunch or frozen for go to lunch or dinners for these last weeks and to help out when baby arrives? I’m so happy to have found these round ups! They are great inspiration for my lunches for work because I work out of someone’s home and even though she lets me use a stove to heat things up I always feel a little awkward about it. Lots of great options for cold lunches on here so thanks! Every time I get in a lunch rut (or any other real food-related rut), I peek at your site and I always find inspiration. It’s obvious that cooking delicious, nourishing meals for your family is a labor of love for you. Thanks for sharing! This site inspired me to create a blog! I’m eleven years old and I decided to write a blog about school lunches from a kid’s perspective. It’s called “Lunch Bunch”! There isn’t too much yet, but I’d really like it if some people saw it. I have one question for the people at 100 days of real food: What is the kids favorite food? Thank you! Did you cut your pita bread or did it come in triangles? This is Ally. That question is for everyone! I haven’t put it on my blog yet, but I probably will. Thank you! 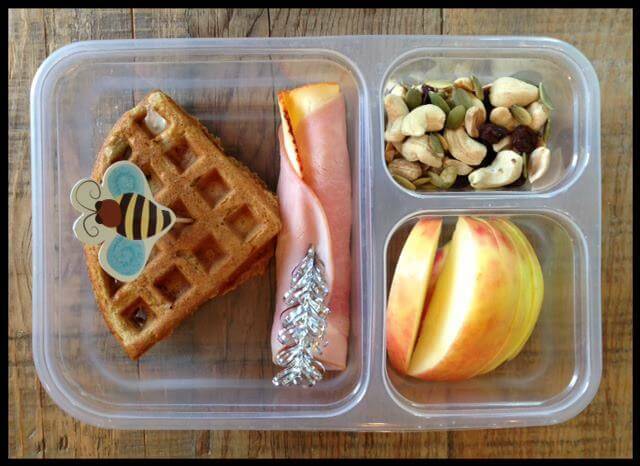 When you pack waffles in the kids lunch do you just let them thaw and pack them cold or do you heat them in the morning? 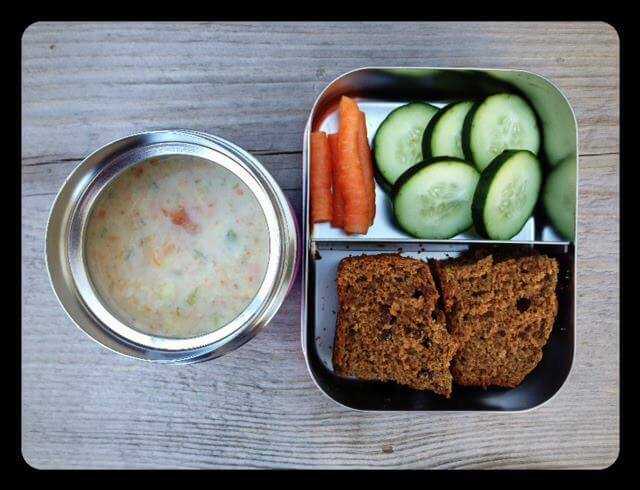 Any ideas on how to change up these lunch ideas for high school kids who want to take their lunch because the school food is gross, but don’t have anywhere to keep the lunch cold, and also don’t want to look weird (and not cool) for bringing their lunches? How do you keep the smoothie pops frozen? Where do you find the large silicone cupcake holders. I purchased some, but they are too short and their contents spills out. 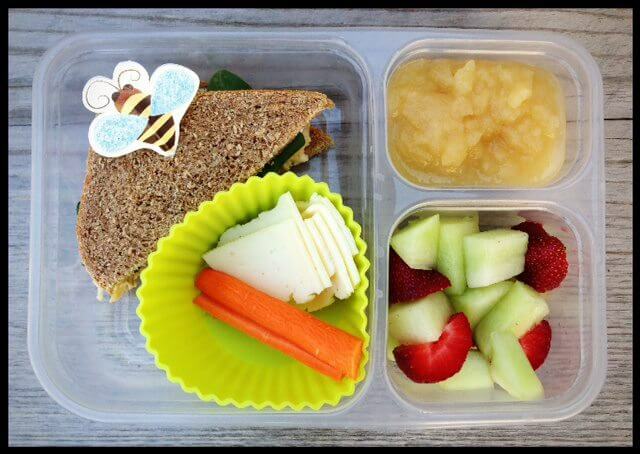 Love this website… gives a lot of ideas for healthy home-made and interesting school-box lunches for kids. Can you please let me know a very healthy recipe for spaghetti with meatballs in tomato sauce? Please… As my daughter has recently started to love this dish, i want to make it healthy. She also recently has started to ‘not-like’ veggies! Hence want to sneak in.. Thank you very much… keep up the effort! 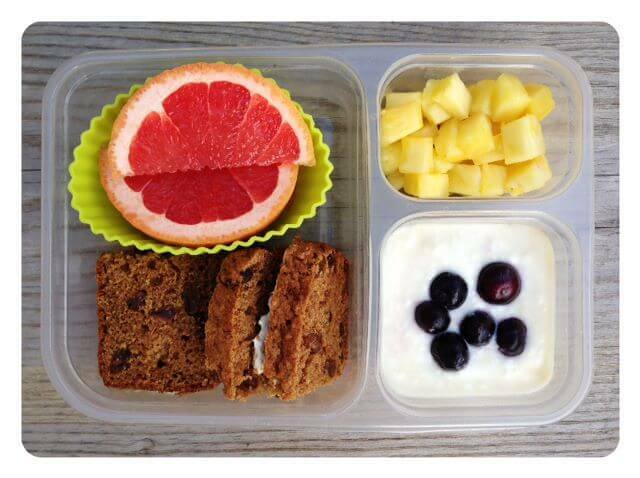 I love your lunch ideas! I’m curious how you prevent your apples from oxidizing? Hello I am a nutritionist and have had difficulty in finding healthy foods for my son’s lunch…that he will actually eat. I have tried everything I can think of but he is very picky. I also think he is overly self conscious about what is in his lunch. Meaning he is in first grade and kids in his class (small group of 16) make comments on what each other had packed in their lunch. So even if he likes something he will not want it any more if someone has made him feel weird about it. I love the idea of the waffle sandwich. Can you tell me what kind/flavor of cream cheese you use and also how do you pack this so it does not end up soggy. My son’s grade does not eat until 1245 so even with ice pack I’m not sure how that would be. Thanks for all the great lunch ideas. Wonderful! Do you make the frozen smoothie pops , or buy those? Thanks! I am not much of a cook, but I love your website and easy to follow instructions. By far one of the best healthy recipe websites I have stumbled upon. How do you keep shredded cheese, died cheese from melting in a school lunch bag. Every time I send a salad to school with my grandchildren, they bring the cheese back because it has melted. Hi. Using mulitple ice packs should do the trick.